Weight limits: Bungee Run: 180 lbs. / Joust: 225 lbs. This bungee run is a multi-interactive unit creating a multiple arena of fun. You can run, jump, or dive til you get the market to the furthest point. Play against each other or team events while measuring the distance. 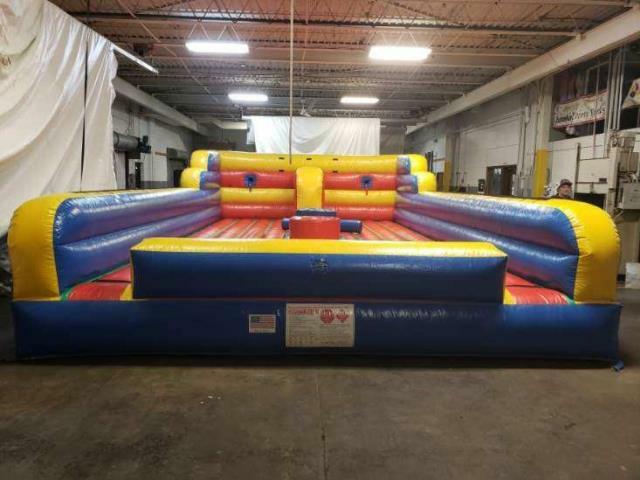 Once you have finished with the bungee, go head-to-head with the gladiator duel joust. This challenges the young and old to strive for victory. Being on two foam pedestals and armed with padded poles, you try to knock your opponent off their pedastal.